A partnership between Santa Lucia Highlands' grower Kirk Williams and his stepdaughter Kori Violini. 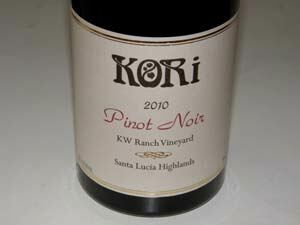 Small amounts of Pinot Noir are produced from the KW Ranch located in the heart of the Santa Lucia Highlands. The vineyard is surrounded by many well-known estates including Garys' Vineyard, Rosella's Vineyard and Sleepy Hollow Vineyard. The KW Ranch Vineyard occupies 14 acres. Grapes have been sold to several well-known producers. Pinot Noir clones 667 and Pommard 4 and Syrah clones 877 and 470. The well-priced, outstanding wine is sold through a mailing list.